Delivered in 2006 with a 2015 refit, Mambo has been completely updated and customized by her owner. Mambo is an all fiberglass constructed 112’/34.14m raised pilothouse motor yacht, designed by Gianni Zuccon and built by Ferretti Yachts Custom Line Division in Ancona, Italy. Mambo is a brand new addition to the charter market running with an experienced and dynamic crew, who have all been onboard for over 2 years. 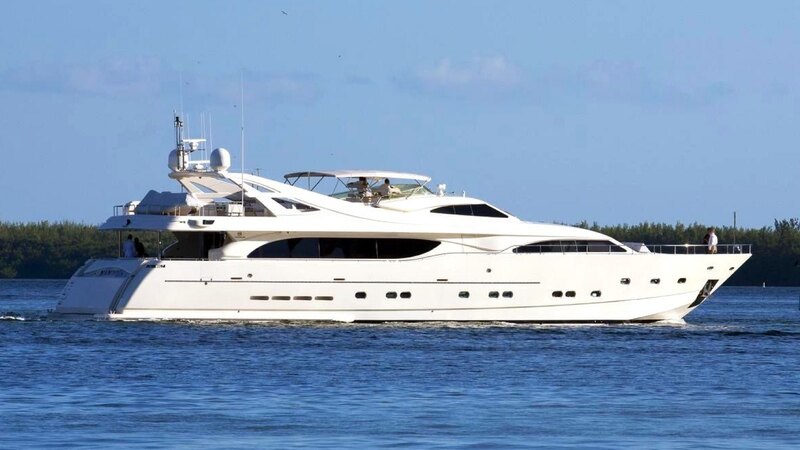 With a spacious interior layout and exceptional flybridge, Mambo is an excellent option for charter in the Bahamas. The main salon’s custom furnishings, coupled with fine woodwork provide a relaxed and refined environment for any occasion. An open and spacious dining salon forward of the main salon features built in cabinetry and easy serving capabilities for crew. With a private and convenient on-deck, full-beam master stateroom, Mambo is designed to comfortably accommodate up to 8 guests in 4 staterooms. Perfect for couples or two families alike. Below deck you will find a full-beam VIP stateroom aft and 2 forward mirrored double staterooms. All staterooms are appointed with personal entertainment systems and ensuite bathrooms. Guests can enjoy Mambo’s open flybridge with plenty of seating, sun pads around a jacuzzi, bar area, and alfresco dining all under optional shade. A few steps down from the main aft deck, a fold out open garage door creates the perfect swim platform for easy access into the ocean.